CalenMob. I love my Google Calendars, and have several — a personal one, one to schedule Corporette stuff, one for my sons’ stuff, etc. — and it never seemed like iPhone’s native calendar did a good job of syncing them. CalenMob bridges the gap for me. There is a free version and a “pro” version for $6.99 — I just bought the pro version. Sheets. Excel seems to be my default program of choice these days, so I like being able to edit everything in Sheets. If This Then That. I’m still playing around with this one, but Lifehacker is perpetually in love with it. What recipes are you guys using? Key Ring. Handy for when you have a bunch of store cards/loyalty cards and don’t want to carry them all with you, so you can scan the bar codes and so forth into the app. Pinterest. I love this for collecting visual ideas — decor things I want to try, outfits I like, etc. You can follow us at http://pinterest.com/corporette. Evernote. I use this like Pinterest, but for articles. I’m still figuring out how to make the most of it, to be honest, but it was a great way to unload my Pocket reading list when I first started. Dropbox. As I mentioned at CorporetteMoms in our post on organizing family photos, I love Dropbox — we first started using it back when I was on Android and my husband was on iPhone (and I’m also just generally suspicious of Apple’s iCloud stuff), and the love continues. Sleep Cycle. I’m still searching for the best “hack your sleep” app; at the moment I like Sleep Cycle. Seven. This app is great if you want a really focused workout — it’s a seven minute HIIT workout, inspired by a NYT article. Do multiple cycles to get the most effect, of course, but even one cycle can help. I also just downloaded the app Seconds to try to find a way to put HIIT intervals on top of music (but haven’t had a chance to try it out yet). DarkSky. Wondering what the weather will be like in the next HOUR? Dark Sky is great for that — it was designed by two people who were driving cross country, and happened to get stuck inside the rest stop without umbrellas when one of those out-of-nowhere storms hit. Would it last ten minutes or an hour? They didn’t know, so they created an app for it. Other basic must-haves: Seamless. Fresh Direct. Open Table. Shazam. I don’t read a ton on Kindle (see my out-of-control Pocket list, ha) but I have that on there too. I’ll also mention Omnifocus for all you GTDers out there — my brother loves it, but I haven’t tried it yet. I will also give a “hugely helpful” shout out to my bluetooth keyboard — I use it all the time for focused writing on my iPad (my focus is sooo much better if the mouse is out of the picture and I don’t have 10,000 tabs open), but I also discovered during some flights last week that it’s also hugely helpful for writing on my iPhone. (I went back to Northwestern University for a conference/group meeting for a women’s alumni group I’m part of, Council of 100.) The tray space on the plane was so limited I found I actually preferred writing on the Notes function on my iPhone, and managed to crank out about 10 posts between the two flights. What are your favorite apps, ladies? 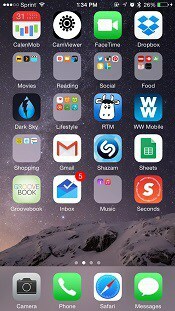 Which apps add to your productivity and/or help you manage information? Which ones make your life easier? Oh, this so fun. I have this app called BREEZE, and it track’s my step’s even better then the FITBIT. It also send’s me messages all day and tell’s me to get off of my tuchus and work, and when I go over the required step’s it sends me a trophy award. I send the email to my dad to show him my daily work, even tho he track’s my steps sepearateley on FITBIT. FITBIT can learn a thing from BREEZE,and this app is FREE!!! So I am telling the HIVE to look for it on the APP STORE. I do not know if it is out for ANDREWOID, but it work’s on MY IPHONE!!!! YAY!!!!! If everyone in the HIVE with an Iphone used it, we would loose a lot of pounds off our tuchuses! Go for it! YAY!!!!! FWIW, I used to have Breeze and it completely murdered my battery. Like wouldn’t even make it through a work day. Ellen, did Alan buy you one of those FANCY iPhone cases that is also a charger? Genius Scan is magic for making your receipts into PDFs for expenses. I love HoursTracker. I used to work a place where you clocked in/out, and found that I missed it when I switched workplaces to my current one. My current one is less about keeping tabs on employees. But it also meant that I missed the 5, 10, 15 minutes that I would stay longer into my timekeeping. It quickly added up to hours, that new work was “getting” from me for free, instead of hours I could use later for dr’s appointments, a day off, etc. I’m trying out ToDoist at the moment. Lists like these make me feel like I could utilize my phone so much more than I do. I’m also trying to figure out Evernote. So far I’m mainly just using it to save recipes (I’ve taken pictures of recipes from friends’ cookbooks and it’s a good way to store), but I’ve read other articles that just seem to use it for everything. The Key Ring app seems brilliant and I need to just download it now before I forget. I love evernote, but it works best when you use it for EVERYTHING, and it takes a while to get to that point. I confess that I use it a lot to takes notes from this site – I have a “fantasy travel” notebook with lots of destination subfolders, and anytime someone makes a recommendation for a hotel or restaurant that sounds interesting, I jot it down. The WebClipper extension for Chrome is terrific too. That is a fantastic idea – I often read things in posts/comments here that I want to remember and then promptly forget about them. Evernote is good for what you describe (taking pictures of cookbook pages) but for a dedicated recipe app, Paprika is great. I use it on Android, not iPhone (there also is an iOS app, and a Windows one as well). It imports from all my favorite s!tes (or has an option to manually import from a webpage), and has options for scaling recipes up or down, making weekly menus or meal plans and then exporting either recipes or meal plans to a grocery list. It stores the recipes and shopping list locally on my phone (so it works even when I’m in my dead spot grocery store) but also has an automatic cloud sync so I can pull up the recipes in my kitchen on a separate tablet. Love, love love. Evernote is my JAM, and I haven’t even used it for articles! My husband and I both have downloaded the app and share one account so that he and I can create grocery/errand lists throughout the week, and both of us have access to them when we’re out and about. My new favorite thing ever. I don’t know about this being a productivity app, but I love open table so much. it’s just so easy to make plans and even to help narrow down options when looking for a dinner spot. AccuWeather has a precipation-for-the-next-two-hours tool now, which is useful and similar to DarkSky. I find it to be a great weather forecast app in general, so that’s my rec. Also PocketCast. I used to use Apple’s stock Podcasts app and then I switched about six weeks ago to Android. PocketCast has so much better functionality and is definitely worth the cash (it was about £2 IIRC). I don’t have Spotify Premium but I find the Spotify app is still great for just putting music on in the background while I’m cooking/ cleaning/ whatever. I use Transferwise for making international payments, so the app is great to have. Memrise is the vocab-and-trivia learning site I use. They’ve hugely improved the mobile app in the last coupld of years and it’s much better now. You can downloaded courses to your phone so that they’re usable offline. I like Trivia Crack – it’s the only game on my phone. OurGroceries is a good grocery list app – it has category-sort functionality, so all Larder stuff is grouped together, for example. You can customise the categories. I have TripIt (recommended by someone on here) and SkyScanner for travel. The Goodreads app is useful, though obviously only if you use Goodreads! I use OneNote for loads of notes, so the mobile app is useful. I never use the Starbucks app to pay with, but the app’s useful to top up my card and to see how much credit I have on there. Strava and CycleStreets kind of go together; CycleStreets isn’t awesome but it’s better than the ‘cycle’ function of Google Maps. Possibly Android specific: I love Google Keep and also the Google Reminders function. If I set a reminder for myself, it’ll pop up in the corner of Chrome on my laptop (when I’m logged into Chrome!). Oh yes, Google Keep is my favorite for running checklists. I use it to keep a list of things to buy when I make it to Target, present ideas and presents I’ve already purchased (after finding presents hidden in a closet I bought early for Christmas one year around after Easter – oops), packing lists and then also just as a spot to store things I copy and paste for a random one-off need. I was wondering if anyone had tried that. It appears very Evernote-adjacent, and I’ve already started doing things in Evernote. Plus, I have to admit, since they took away Google Reader (RIP, my precious) I have been a bit skittish about new Google stuff. sorry i accidentally clicked report! I’m going to have to try the Key Ring app. I use Evernote regularly and the Reminders app that came with iOS for productivity. I use Reminders both for things that I need to have an alert for but also for running lists of things like groceries or packing. I also regularly use YNAB to track my budget and spending and Numbers to track my miles and points for various credit cards and shopping portals. For personal stuff I use Kindle, Overdrive, and Goodreads because I read a ton while commuting to work. I also use Pinterest for fun and have an extensive collection of recipes on there that I’ve made or want to make. If I come across a recipe that isn’t online I’ll snap a picture and save it in Evernote. There’s no need to buy a new app (e.g. calenmob) for google calendars now bc google put out its own google calendar app that is GREAT. Slice – For tracking online purchases, tracking shipments, auto-notifications of price drops on recently purchased items (and pre-written emails to the store’s customer service requesting a price adjustment). I am in love with this app. Oohh yes, Slice! I love it and use it constantly since I do most of my shopping online. I love the New Yorker app because I have a subscription but I never have time to read them each week and now I can recycle anything I don’t get to and catch up on my phone when I have the free time. It has liberated my coffee table! For NYC ladies, I love the subway time and bus time apps because it lets me know when the next train/bus is coming and if I have time to grab a cup of coffee before it gets there. For a while I was using the Money Squared App because it lets you manually track your spending without having to share any personal info, but I haven’t been good about it for a while now. I also keep meaning to download one of those business card storage apps but I haven’t gotten around to it. One of my most used apps is LastPass – I use it to keep all my passwords for home and work, and now the ones my 8 year old is starting to accumulate. It is also my “if I get hit by a bus” solution because pretty much all of our bills are electronic now instead of on paper, as well as all our banking, and if something happened to me my husband wouldn’t know all the or even webs!tes passwords, since so many s!tes change regularly and make you update your password every 90 days or something stupid like that (online mortage portal where all I can do is download the tax forms, I’m looking at you and your ridiculousness). The master password is in our paperwork safe, along with a list of everywhere we have an account that is only online/paperless. Apps on my phone.. a lot! -I use a mix of wunderlist and Google Keep and any.do for home reminder things – I like Google Keep because I just uncheck items when I need to buy it at the grocery store again…I use any.do only for recurring to-do lists (like paying bills) b/c when the deadlines come up it pops up with an “any.do moment” at 10 am to remind me everything i have to pay that day. -trigger (it’s like if this then that) – I have recipes for when it connects to wifi at home (turn on sound, tells me i’m home, etc), when it disconnects from wifi at home (set to vibrate, reminds me to lock the doors), when it connects to bluetooth in the car (turn on gps, change display timeout settings, and allow rotatable view), disconnects bluetooth in the car (turns off all the gps and reminds me to lock), and connecting and disconnecting from work wifi (silent at work, then vibrate leaving work). I have the free version. -evernote – i use this for bucket lists, apartment hunting, travel planning, agendas, and novel writing. and recipes. • Slice – thirded for shipping tracking and also they automatically write the email to request a discount if something you’ve recently bought goes on sale. • 1Password – I also have lastPass at work, but especially for multiple Apple devices this is so much nicer. • Byline – for RSS (and what I’m using as I type this) the dearly departed google reader is replaced ably by feedly. • weekCal google calendars that are easy to read if you’re used to the desktop version and looking at multiple calendars. • IFTTT- favorite recipes are usually saving things to Dropbox, posting to Twitter, turning on my lights at home. Buy Me a Pie — It’s a shopping list app that you can sink with a spouse/roommate, etc. My husband and I have it synced, and we keep running lists going for the grocery store, Target, anywhere else we want, so we both know what we need at any given time. Any.do is my favorite list app. Integrates with my Cal, so I can see my to do list along with my appointments/meetings. My Pocket is outta control, too.